ever heard of sophie digard's exquisite crocheted scarfs? for years now, i've been trying to perk up the courage to crochet one, a digard look-alike, an ersatz shawl. for if you can crochet one granny, you can crochet a sophie digard design whose beautiful accessories do rely on age old designs (unfortunately priced on the wrong side of my balance sheet). so, each time i'm popping in at the local thrift shop, i spy around for the thinnest yarn, wool or cotton, i don't mind. but i can never quite lay my hand on what i'm looking for. 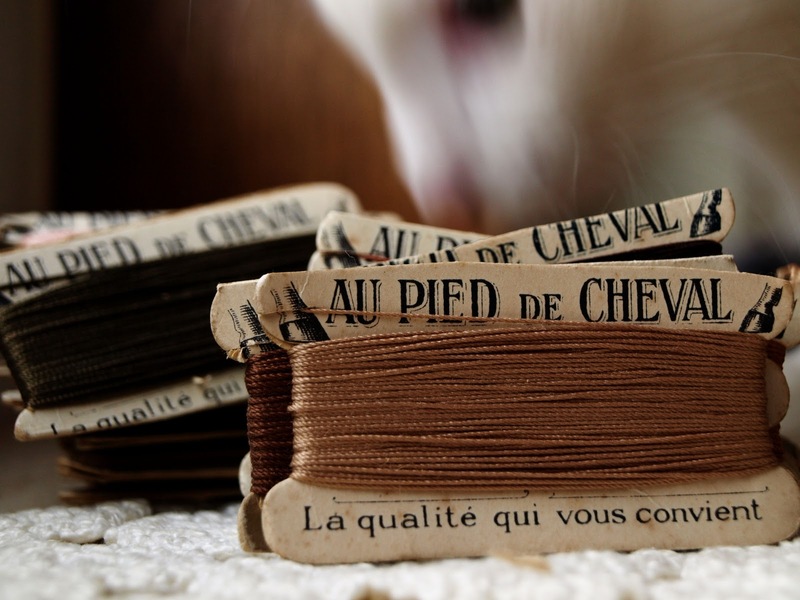 however, this week, i could not resist these vintage coils, holding silk couture thread. au pied de cheval, they're called. now, let's not take my dear intentions on the hoof! sophie's attic open, me having a curious look around. ☻ ps - i also stumbled upon the loveliest doily ever this week! Oh, that's gorgeous! I want to crochet one too now! Why is it so difficult to find thin yarn these days? Our thrift shops don't carry that sort of things, and I found some fairly thin wool in Lisbon (for sock making), that I just had to buy. I just love that vintage thread, the packaging is so sweet and simple too! Been looking for some of that for ages but think will have to resort to ebay! oh drool..how divine & right up my ally. 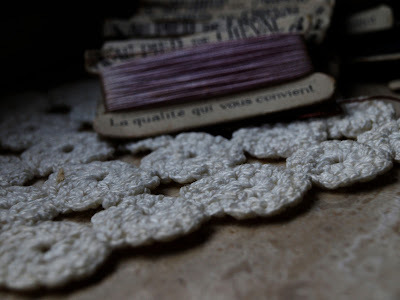 oh and that sweet little crochet rounds doily is superb. oh mooie sjaal maar euh ik ben helemaal verkocht...dat garen om die kartonnetjes.tja, ik heb een passie gekregen voor garen/draad. How lovely! Here in Australia you could ask any price for that. It shoudn't be used...just displayed! I love the packaging and the result is wonderful Momma! 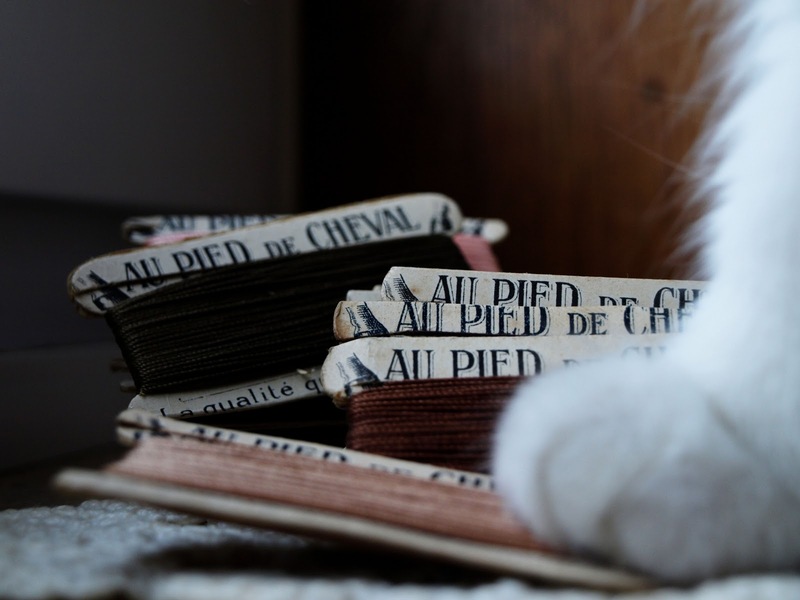 love all those wonderful papers the yarn is wrapped on! Oh, that scarf really IS exquisite! It looks like it is woven, not crocheted... I guess because the threads are so fine. I so admire your ability to crochet. Did you teach yourself? beautiful little treasures ... and what a funny name ! !